How to Hold a Readers Theater Day – Literature Meets Fine Arts and Fun. Some time back we had a Readers Theater Day at my house with Jonah and several of his high school friends. Readers Theater is a great way to accomplish several cool things for literature learning and fine arts experience through drama. It brings a play to life as participants read the script aloud. It strengthens read-aloud speech skills in teenagers. It helps slow readers add a book to their book list before year end (a play is a book, but you’re done in a couple of hours). 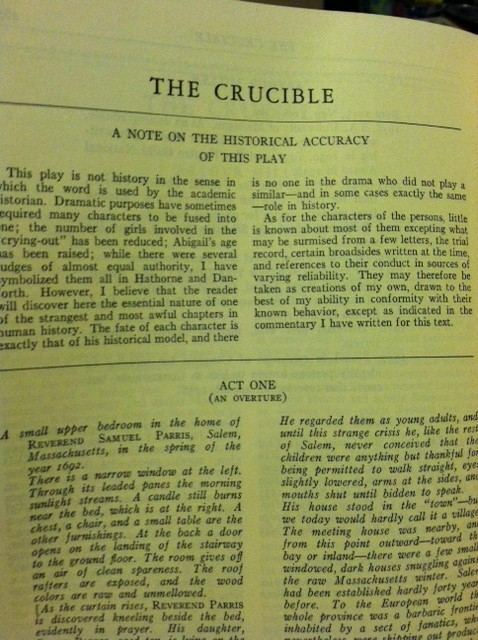 We sat around my living room and I explained a little bit about the play (we started with The Crucible). Then we let the kids choose the format. They could either assign parts for each Act (e.g. Jonah will read Rev. Parris, Carlie will read Abigail) OR they could just take turns going around the room and reading whatever line came to them regardless of who the character was. They elected the read-around-the-room format because they were nervous about their skills as readers and didn’t want to commit to reading one of the main roles. Everyone was allowed to say, “Pass,” if the line that came to them was longer than they felt comfortable to read. I was the facilitator. That meant that I read the stage directions. In between Acts we took breaks for snacks and bathroom trips. It took a lot longer than I anticipated. I was thinking, “A play takes 2-3 hours, so we can read 2 plays if we give ourselves all day.” Not exactly! When students are cold-reading text they read much more slowly than the actors who have memorized and rehearsed the lines will deliver them. So we only got through one play that day. It took some real effort for everyone to get focused on the material and stop goofing around. After the first Act took over an hour, we had a pow-wow over some food and decided to tighten up the ground rules so we could finish before the end of the century. Ground rules we added – everyone follow along with every line (so you don’t lose your place while others are reading); no goofy voices (reading with expression is great, just keep it on task); try to pay attention to how to say the character names (calling them something silly instead of pronouncing their names causes distraction). The online text thing would have been better if the copy we were using hadn’t had so many typos in it. The Crucible did not happen to be available on Project Gutenberg, so I had found a teacher site where someone had posted the text, but it had lots of mistakes in it, and those really threw us from time to time. The kids really did start to get into the story, the characters and the ideas, and by the time we were done they all agreed it was a good play and they were glad they’d read it. If a local group produces it, I guarantee we would all want to go see it together. The difficulties we encountered during the first Act/first hour really challenged THE KIDS to find ways to focus better on the activity. Instead of the moms laying down the law, they themselves decided to make some ground rules to help themselves stay on task. When we started, all but one kid was quick to say, “I’m not good at reading aloud.” When we were finished, I had to say to them in all honesty, “Guys, not ONE of you is bad at reading aloud! You all did really well!” And one of the kids said, “We did okay, didn’t we?” They were clearly proud of themselves. There was a huge sense of accomplishment at the end of the activity. They could go home and add a book to their book list. They had done something that was a challenge for them. They had done it in a safe place, with friends along. And they had really interesting ideas about life to think on and discuss. Vicki’s son asked if we could go ahead and plan a few days like this for next school year. My son agreed – even with the minor bumps in the road, he felt like it had been a great way to spend a day. Have any of you tried Readers Theater? How did it go for you? The EBookstore has study guides available to accompany Sophocles’ play Antigone and Chekhov’s dramatic work Uncle Vanya. These guides are a great resource for you, mom, as you prepare for a Readers Theater Day with your homeschooler — or for enrichment for your students after the curtain has fallen on your day of reading a play! For even MORE drama, check out my original scripts The Search for the Solution and A Weekend in Calcutta! We have a few Shakespeare plays coming up next fall. I so want to do this! Is it doable for teens to read Shakespeare cold? Any suggestions? Hi Cendrine! It is doable with Shakespeare and teens, but it may need a little bit more involvement from the grown-ups than a non-Shakespeare play would need. Vicki was in a co-op years ago that did, indeed, do this with Shakespeare. If you have a few folks experienced with Elizabethan English to guide and support and gently offer pronunciation or a brief explanation of what something means, you can have a great time with The Bard in a readers theater setting! Thanks! I think I’m going to do some more planning to make this happen! What a cool idea! Cool mom! You probably opened a whole new world for some of these kids. Well done. Hey, Debbie, if you try it, can you tell us about it? Have fun!